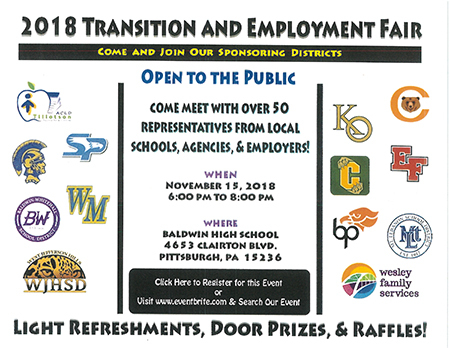 The 2018 Transition and Employment Fair sponsored by the Carlynton School District and 12 other local school districts and agencies will be held November 15, 2018 from 6:00 to 8:00 pm at Baldwin High School, 4653 Clairton Blvd, Pittsburgh, PA 15236. This annual event, sponsored by the Carlynton School District and 12 other local school district and agencies, will provide the opportunity for students to meet over 50 representatives from area school, agencies and employers. Save the date for this important event and before to register by CLICKING HERE. Don't miss this informative evening. Light refreshments, door prizes and raffles will be offered. The event is a great chance to say, "Yes, I can!" rather than "I can't" while learning about opportunities for success and advancement.